Organisations often undertake projects and transformation programmes to realise strategic objectives (e.g. customer at the center, digital uplift), however, they are frequently criticised for failing to achieve the intended benefits. Studies show that over 70% of business improvement projects fail to deliver their expected benefits and even when they are achieved in part, often they are far from fully realised. Too much emphasis on deliverables, or capabilities, which on their own do not result in specific benefits. No mechanisms being in place to manage the realisation of the benefits. Undertaking a project or program and investing in change, should result in realisation of benefits of some kind (otherwise why do it?). 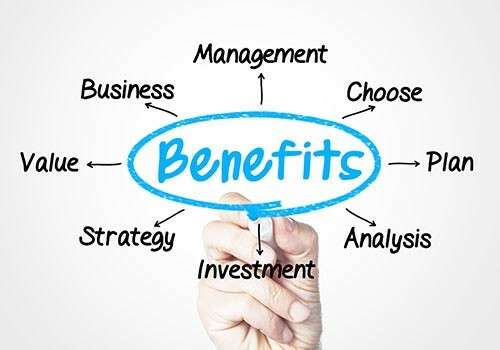 For benefits realisation to work it is crucial to identify clear benefits (early in the change life-cycle) and to assign ownership to those responsible for planning and managing their achievement, in other words one need to manage Benefits Realisation. Managing Successful Programs (www.msp-officialsite.com) defines a benefit as “measurable improvement resulting from an outcome which is perceived as an advantage by a stakeholder”. Benefits Realisation is a continuous process of envisioning results, implementing, checking intermediate results and dynamically adjusting the path leading from investments to strategic objectives. Benefits Realisation is a process that can and must be managed, just like any other business process. Benefit Realisation is often confused with Return on Investment (ROI), but it is important to note that Benefit Realisation is not the same as ROI. Whereas ROI is focussed on the tangible value, often expressed in monetary terms, to justify the investment, Benefits Realisation is much broader as it is about achieving some form of advantage (or benefit) for the key stakeholders (e.g. improved user experience). Projects or programs do not deliver benefits. They deliver outcomes which change or create capabilities that will enable the realisation of the desired benefits. Benefits are not automatic. Benefits realisation is beyond project management, and requires active monitoring of the delivery of projects, the effectiveness of change and the achievement of outcomes. IT is an enabler for business benefits. ICT provides technology capabilities, but is insufficient by itself to deliver business benefits. Technology enables changes to the way people work, with new processes and new ways, and this needs to be managed as a program of business change. Benefits are long term. Benefits will flow over a period of time as people learn to use the new technology and systems and integrate it into business processes. Benefits realisation is a long-term process extending beyond the life of component projects. Benefits realisation requires governance. The benefits realisation process will inform the program business case and program plan, and this needs to be synchronised. Benefits processes must be linked with program governance. Not all changes delivered by a program enables business benefits, sometimes (part of) a change can be counterproductive and provide a ‘disbenefit’. The Oxford Dictionary defines a disbenefit as “a disadvantage or loss resulting from something”. It is important to factor significant disbenefits into the business case and manage them through the program in the same way that benefits would be managed, except that the impact is to be minimised rather than maximised. Quantification of disbenefits also provides a true perspective on realisation of the strategic objectives. Some disbenefits will be identified as the program progresses. It is important that these be factored into the overall benefits equation as the value of the program may be diminished to the point that it becomes non-viable, i.e. the business case doesn’t make sense anymore. How to manage Benefits Realisation? The benefits realisation process is based on a team effort and joint commitment from the business and the project/program to identify and deliver the benefits. For each benefit, it needs to be determined when, what and how metrics and measurements will best demonstrate realisation of the benefit. When — Measurements to be taken throughout the remaining project phases, for baseline, interim and target data. What — Wherever possible, existing measures should be used. If existing measures are unsuitable or not available, the requirement to determine and capture new measures needs to be included within the project scope. How — Measurement activities can either be conducted as a self-assessment, independent assessment or external assessment. The type of assessment is dependent upon the nature of the initiative and the degree of integrity or independence sought for the performance of the measure. Metrics — For each benefit, obtain details of the current performance of the service or practice (the baseline) and estimate the target value. Record how the measure was taken, the findings, risks and dependencies, assumptions and any other information of relevance to allow later comparison. Risks & Issues — Throughout the remainder of the benefits realisation lifecycle, there will be risks and potentially issues associated with the realisation of benefits. Working with key stakeholders and other specialists, determine and assess the risks and associated data, capture the detail and record with the other benefit details. It is essential that the benefits realisation approach be modified to suit the capability and size of the organisation. Preference for monetary benefits (i.e. positive return on investment), to the cost of potentially extremely valuable intangible benefits. Benefits are often overstated in the business case to ensure that the business case is approved and funding is obtained. Benefits are linked to an imprecise business strategy. If the business strategy is loosely defined then it becomes easier for projects / programs to link to it, and thereby gain approval to proceed. Failure to understand that the benefits lifecycle extends past the traditional project/program lifecycle, often for an extended period. Most of the focus in programs and projects is on time and cost (since they are easier to measure), less on risk and quality and almost none on benefits since tracking benefits is not well understood. Consequently, if a project or program is delivered to schedule and budget, success is declared. Not managing project/program scope by benefits. Many projects focus on the deliverables, not intended outcomes and most certainly not on intended benefits. Manage business transformation projects or programs based on realisation of intended benefits, not the delivery of artefacts. Back to the opening statement of 70% of transformation programmes failing to deliver the intended benefits and therefor failing the realise the strategic objectives. This success rate can be improved with organisations managing the realisation of the benefits of their transformation program, starting with a realistic business case and tracking the impact of change in the business well beyond lifecycle of the program.